The Joy and Freedom of Flight - - PAGE 417. The Joy and Freedom of Flight · · PAGE 417. July 4, 2017: This is the 241st anniversary of the 1776 Declaration of Independence for the 13 colonies that would become the United States of America. 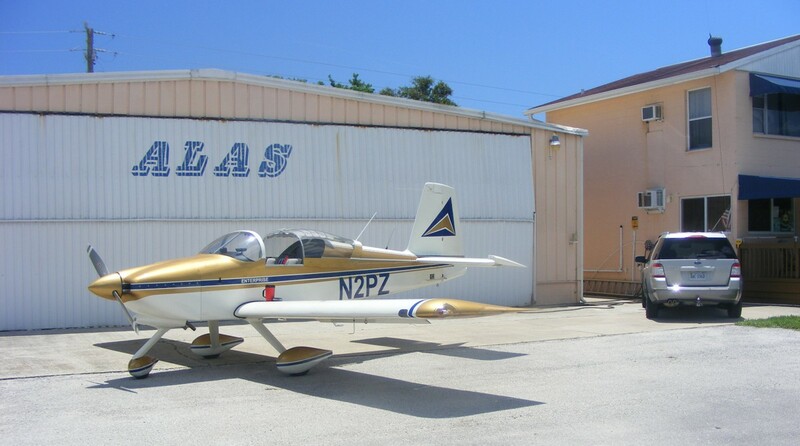 What better way to celebrate that freedom than to fly an airplane I built in my garage from October 2002 to the end of April 2005. The first 135 pages of this web site are about building this airplane "Enterprise" and the voyages she has taken with me. 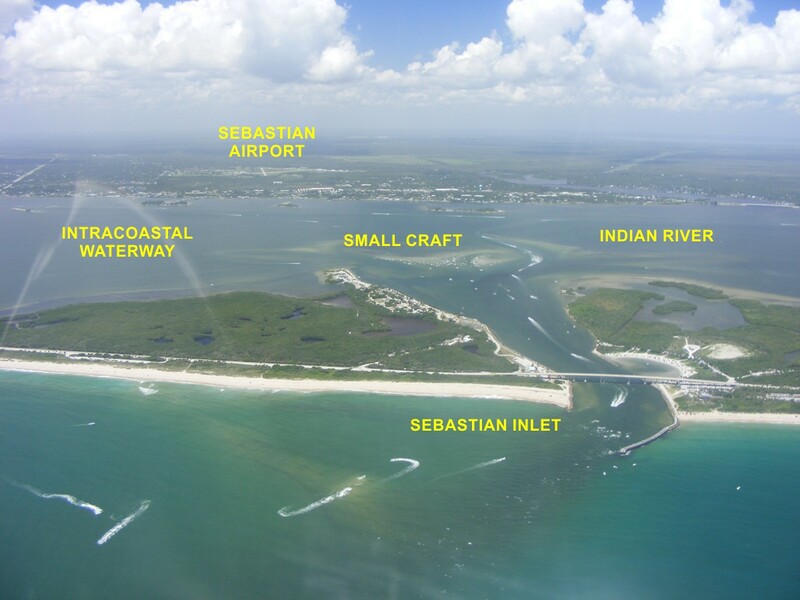 Today I get to see the Sebastian Inlet to the Indian River Lagoon from a new perspective, down low and up to about 1,500 feet above the water. That red streak is a canopy reflection of an empty five-gallon fuel can in my cargo area behind the seats. The red streak points to a shallow area where a lot of small boats are anchored and I have no idea at this time why. You may find some information about WHY via this WEB PAGE. 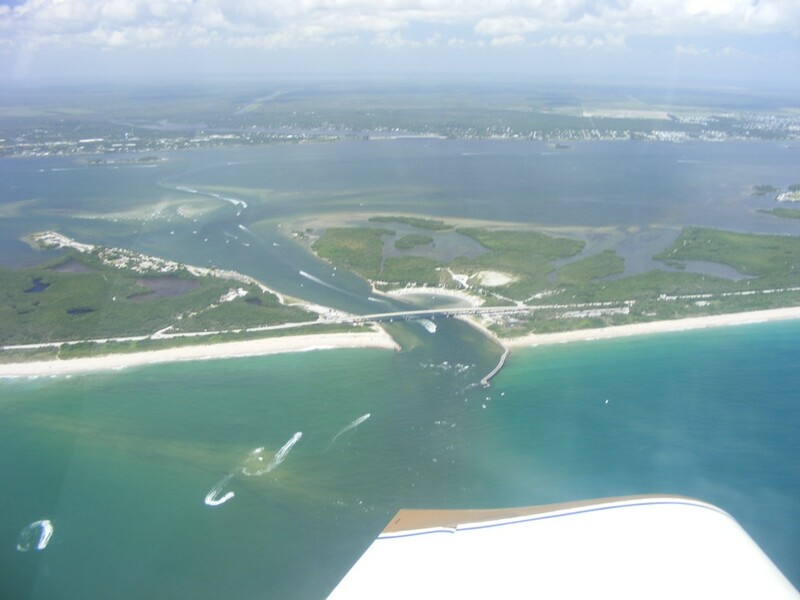 Here is the close-up view of the beach, the bridge, and shallow sand bar area with a number of small boats out there cropped from the image above. The beach is rather deserted as most folks like the "swimming hole" semi-circle near the bridge on the north side of the inlet. 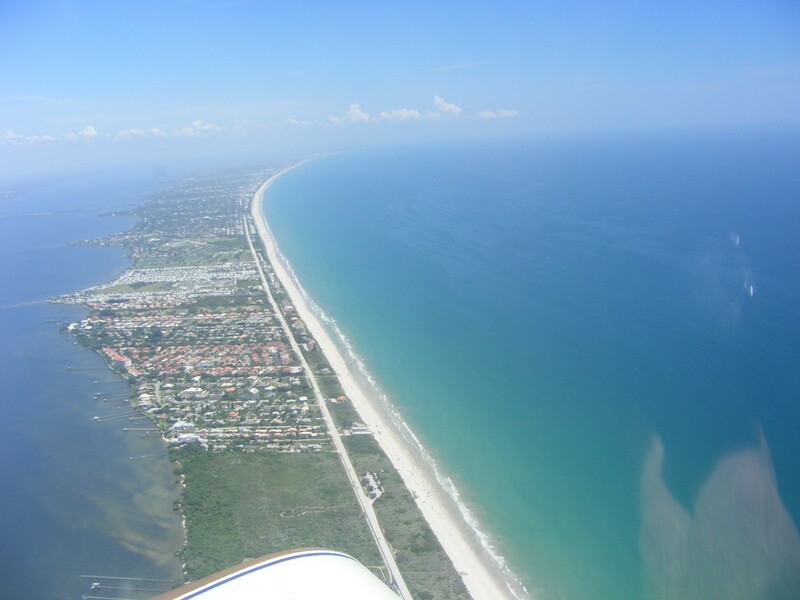 That highway on the barrier islands is Florida state route A1A. The current flowing through the inlet can be swift when the tidal flow is changing. The view from a bit higher reveals more of the surroundings. I walked out on that jetty that sticks out from the beach a few years ago. Shooting behind the wing gives a view of the whole area and the labels I have added below. The words SMALL CRAFT mark the spot where many boats were anchored when I flew over that area inside the inlet. Here is my last photo before turning my attention to points to the north. 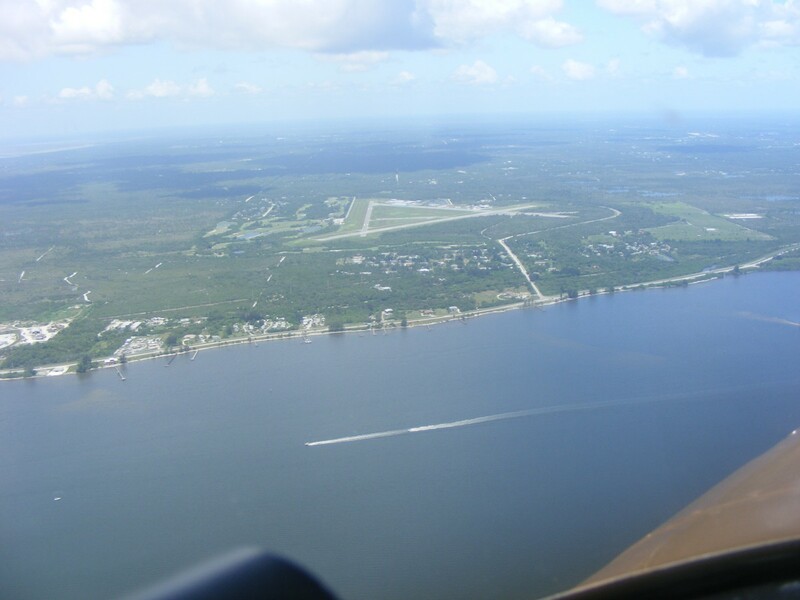 US 1 is the highway on the mainland hugging the shore of the Indian River. You can see more of US 1 as I get closer to the Valkaria Airport (X59) for a touch and go landing on runway 10. At this point, I am listening on their CTAF frequency of 122.72 MHz. No other airplanes are on the radio or visible as I turn to fly over the field to check the wind sock. Both of the runways are 4,000 feet long on this air base built in World War II as an airport that supported operations at Melbourne Airport. The history is found in this Wikipedia article. 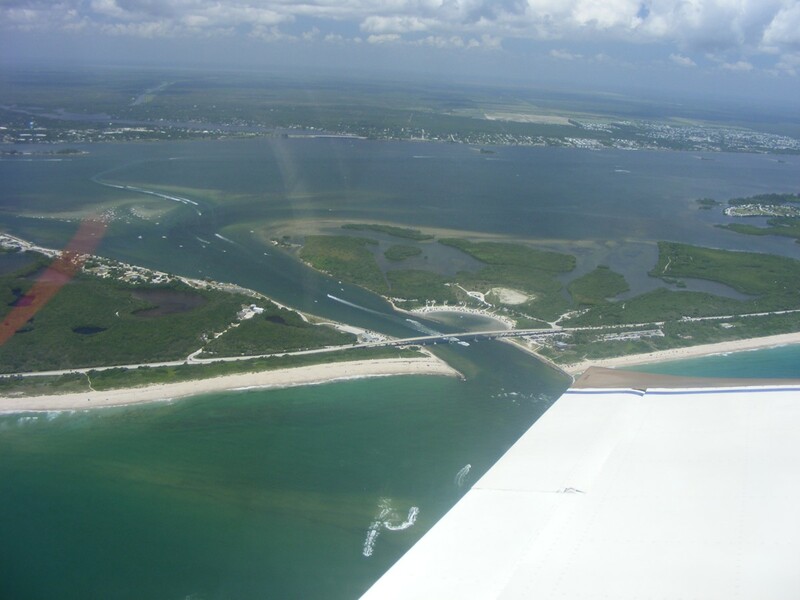 The departure took me back out to the barrier island with a turn-around-a-point maneuver at another pilot's house out there. The image below was taken as I was getting set up for that 360-degree turn with constant altitude keeping his house off my left wing. 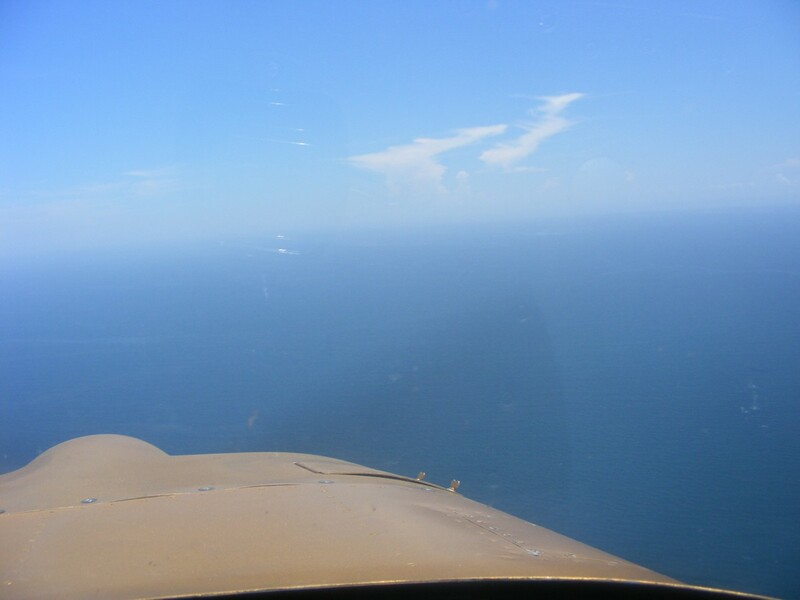 Before I made the turn north, I took this image looking out to see to the vastness of the Atlantic Ocean. The reflection on the inside of the windshield is my camera. This is my GPS ground track in this area. The triangle shape around the airport is my flight parallel to runway 32 then turning west to line up with runway 10 for landing into the wind from the ocean. I always listen to the Melbourne Airport control tower frequency when I pass by here to be sure there are no arriving or departing airline flights in the area. That is the Eau Gallie causeway just beyond the nose. 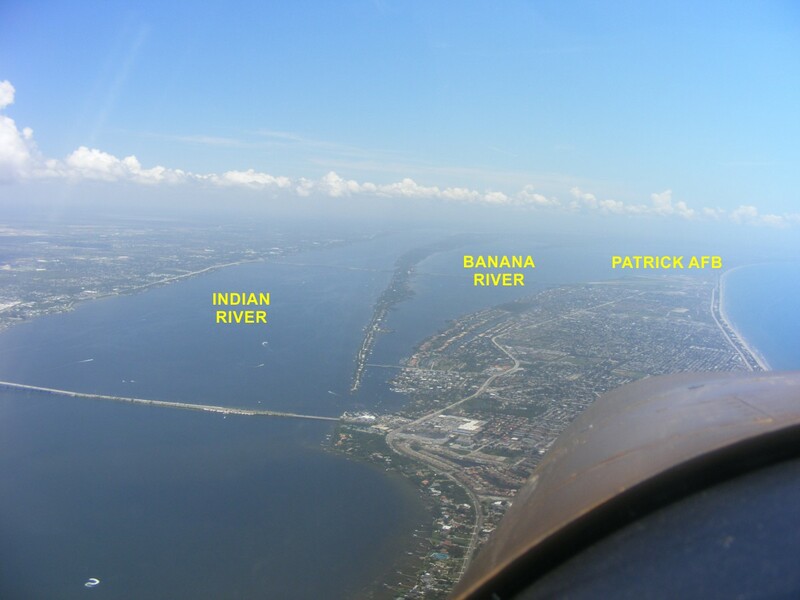 The large island below me narrows considerably going north to a point where Patrick Air Force base occupies all the land between the Ocean and the Banana River. 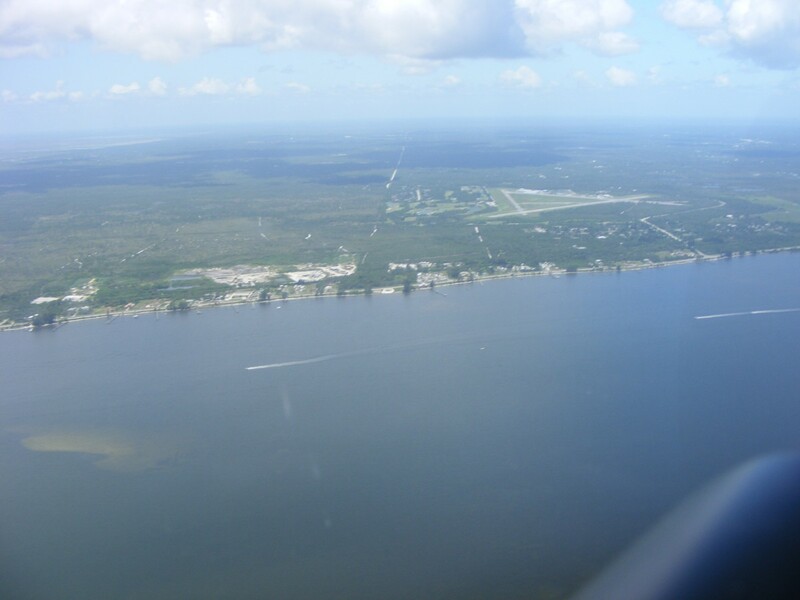 That strip of land between the Indian River and the Banana River is the south end of Merritt Island. Lake Washington is a major source of fresh water for the city of Melbourne. 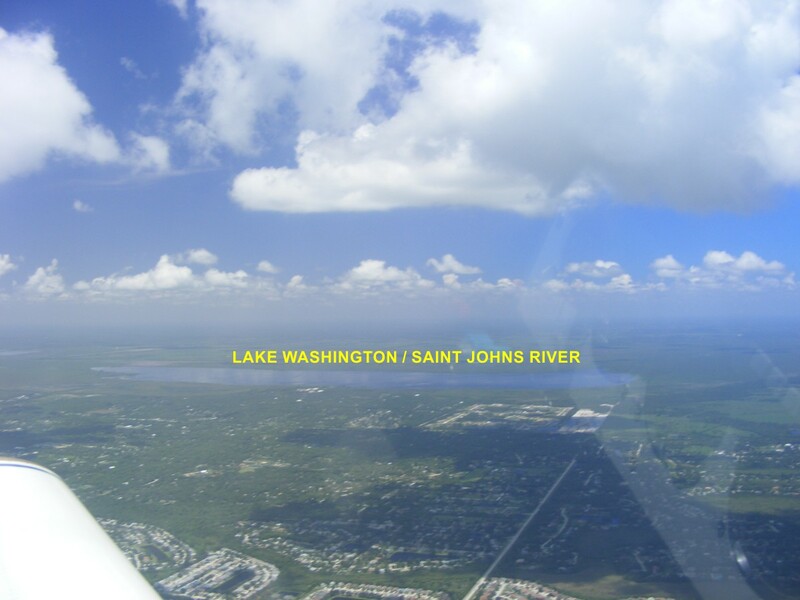 The Saint Johns River feeds the lake from the south and continues northward from here all the way to Jacksonville and Mayport, Florida were the river empties into the Atlantic Ocean. 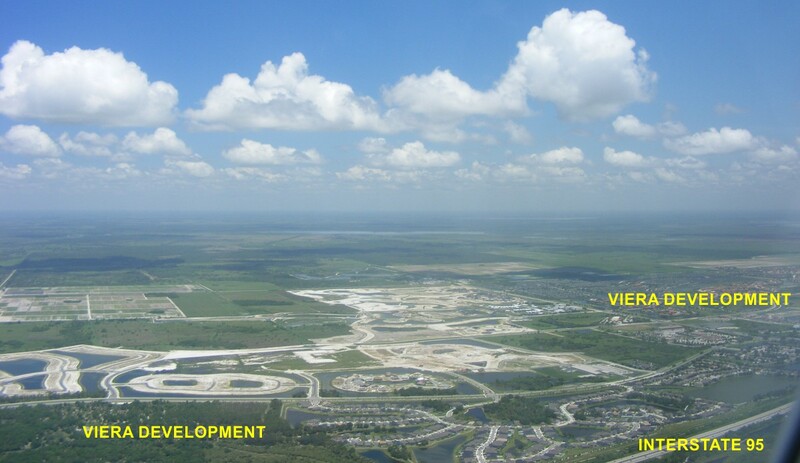 Viera is a land development project that is currently still using a Melbourne zip code address. The area is expanding further west of I-95 and south of the main area of the "town of Viera". They have a hospital there, a high school, and a baseball field used for spring training by the Washington Nationals major league team. The winds on approach from the south at 800 feet were a tailwind of 8 MPH. 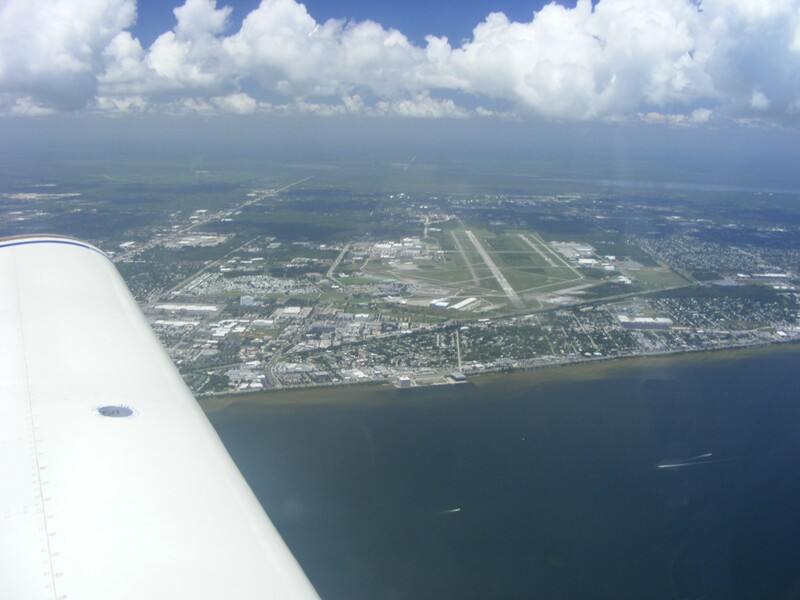 As I got to 500 feet AGL, the winds became calm and I completed the landing on runway 36. 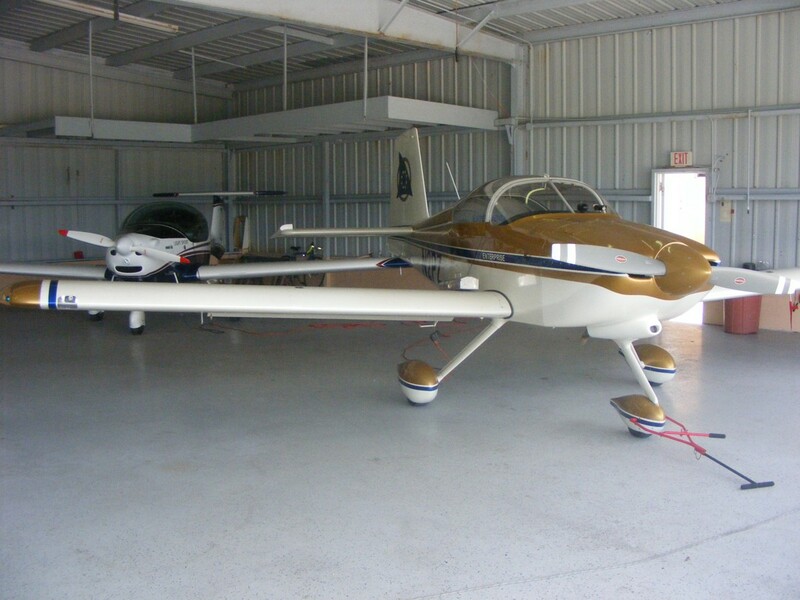 I put the airplane in the front for a flight this coming Saturday, weather permitting. The altimeter still shows the airport at the elevation I calibrated before my departure. The day was a good one with a full-stop landing at Sebastian and a short discussion with a couple of sky divers. 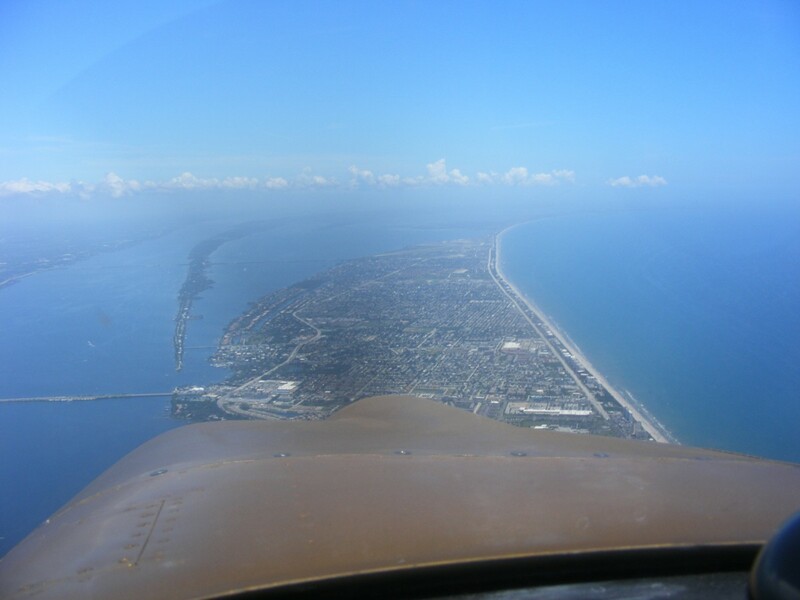 The trip back home had a touch-and-go landing at Valkaria and a turn-around-a-point on the barrier island southeast of Melbourne. 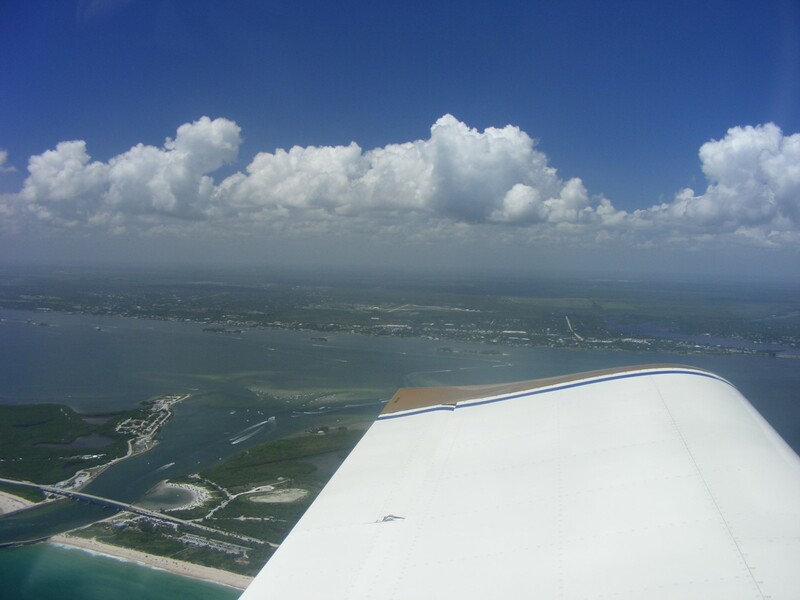 The Hobbs meter added 1.1 hours for a total flight time of 390.5 hours since June 9, 2005. The mileage recorded by the GPS 296 today is 105.6 miles.